The game will be coming out for the PS3, Xbox 360. Wii and the DS with each version having it's own distinct features but all will include a career mode and forty songs to play along with. Oddly, the console versions will not include vocals, but the DS version will. There is no official song list yet, so keep your eyes peeled for more announcements regarding that but I did see a few that were available on the demo which were Blitzkrieg Bop, Detroit Rock city, We're Not Gonna Take It and All The Small Things. There are eight playable characters and various locales ranging from garage to county fair to rock arena. Unfortunately, even though they showed off the drum kit at the presentation, they didn't provide any photos of it so keep an eye for that as well. 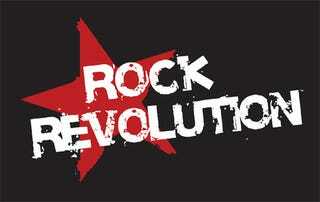 Is Rock Revolution going to be a Guitar Hero or Rock Band killer? Probably not, but it will be interesting to see how it actually does in the market. I'm afraid however, that this might be a case of too little too late.